Steve Caldwell, owner of StoneGate Homes got his start in Iowa — where as a young boy, his upbringing taught him the value of hard work and integrity. Years later, when it came time to put these traits to the test, he did so by creating StoneGate Homes. Now he has been crafting fine residences for more than 30 years. And the values instilled in him as a child are apparent in his approach to life and business. Before launching his company, Steve and his wife, Jody, traveled the country to seek out innovative home styles and designs. What resulted was a premier gated community in Colorado Springs called StoneGate Terrace — a perfect mix of modern design and old fashioned pride. The company has grown since then, and if any builder is satisfied with the product they build, it's the Caldwell's. They live in one of their own StoneGate communities, right alongside their customers — who they now call friends. 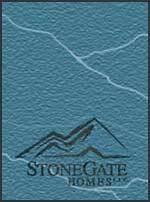 StoneGate supervisors have an impressive amount of experience in the home-building industry. We demand top-quality expertise from our staff and this translates into the creation of many quality homes. Our corporate citizenship in our beautiful state of Colorado is truly a team effort — from speaking at local high schools to encouraging young people's interest in construction and corporate America. At StoneGate Homes, we love finding the little ways to give back to the community that has given so much to us. The reason is simple: For us, building homes is more than a business. It's a creative and satisfying lifestyle that allows us to serve families like yours while making a difference in our community. We invite you to discover this difference when you choose to build with StoneGate Homes. Stonegate Homes is a new home builder in Colorado Springs & new home builder in Estes Park, Colorado. Stonegate Homes has been designing and building exceptional custom homes for over 30 years.